apparel and accessories for favorite shows past and present. -- Delivery Agent's offering on TVLoop will include SeenON! more way fans can deepen their engagement with a show. "Through TVLoop, we aim to provide the richest online TV experience for fans, and partnering with Delivery Agent to add its shopping capabilities further enhances that experience for consumers," said Kevin Chou, CEO at Watercooler. "Not only does partnering with Delivery Agent increase our ability to build a one-stop shop for all things TV, but it diversifies and further strengthens Watercooler's overall monetization strategy." "Watercooler has millions of passionate TV fans on TVLoop who love to engage with their favorite shows online, and we're excited to add an additional dimension to these applications with a social shopping experience," said Mike Fitzsimmons, Delivery Agent CEO. "The demographic we're reaching on TVLoop represents a key target audience of avid entertainment enthusiasts who are a natural fit for our e-commerce offerings." Watercooler is a Mountain View, Calif.-based company founded in 2006 that aims to make connecting with your friends and other fans of your favorite sports teams and TV shows more compelling than ever before. Through FanSection and TVLoop, Watercooler (www.watercooler-inc.com) provides the most extensive network of online fan communities around sports and TV entertainment within the top social networking sites including Facebook, MySpace, Bebo, Friendster, and hi5. Watercooler has more than 30 million registered fans and has raised a Series A round of financing from Canaan Partners of Menlo Park, Calif. Delivery Agent, Inc. (www.deliveryagent.com) is the leader in shopping-enabled programming and content monetization for more than 125 entertainment properties from major media companies such as ABC, CBS, NBC Universal, Twentieth Century Fox, MTV Networks, Martha Stewart Living Omnimedia, Boston Celtics, UFC, and The Weinstein Company. Delivery Agent created the market for shopping-enabled programming by redefining how products related to entertainment are cataloged, merchandised and sold online. Since its inception in 2001, Delivery Agent has deployed its comprehensive technology platform, including e-commerce applications, video and mobile products, and interactive advertising solutions to create profitable connections among entertainment content, consumers and brands. 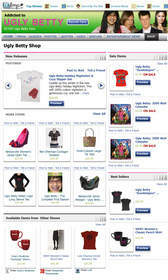 To date, the company has developed a network of more than 90 distinct branded shopping sites for its partners and its own SeenON! (www.SeenON.com), the definitive online shopping destination for products seen on screen. About this company Watercooler, Inc.